Noted artist Thurlby applies his creative sense of design to an alphabet of New York City. Readers will be immediately struck by the artist’s distinctive style, which uses mixed media and digital techniques to represent the famous sights of the Big Apple. The flat dimensions and striking use of color fashion vintage-poster–like depictions for each iconic image. The marked diversity of the people depicted is anything but vintage, happily. From the American Museum of Natural History to the Bronx Zoo, none of the selected letter pairings, each represented on a double-page spread, is a stretch, which happens too often in themed ABC books. 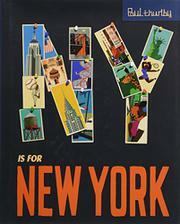 D for “Downtown Manhattan” illustrates Chinatown; the Empire State Building and “ice skating” at Rockefeller Center require 90-degree rotations for full appreciation; N is the New York Public Library; Q is for Queens; V is for “the Village”; X is for the “New York Stock EXchange”; and Y for Yankee Stadium, of course. Best of all is a Where’s Waldo–esque device in which King Kong himself appears in every scene, sometimes large or sometimes teeny. Sharp eyes will detect him in the crowd at Grand Central, enjoying the view of the Brooklyn Bridge, piloting a plane at JFK, and jogging Uptown outside the Guggenheim Museum. Naturally, he has his own page for the letter K.